If you want to improve your finds rate, this book will show you how to find essential records and how to carry out research in libraries, archives or on a computer — whether you own one or not. You will be able to read “case studies” and see the results, so you can decide the best form of research to find the type of coins and relics, which you prefer. If nothing much ever happened where you search, then all you can expect your finds bag to contain is — nothing much. So to bring home the finds you need to search sites where human activity took place in the past. But how do you locate such sites? You could try your local library but you can’t go into a library and ask the librarian to find you a productive detecting site. They just wouldn’t know what to look for. You could employ an expensive professional researcher but I guess that’s out of the question for most of us. So you’ll probably be taking the do-it-yourself approach. It can often be a daunting task, particularly if you are a novice, to find sources of data of direct use to you in amongst vast archives of material and it can take years to learn exactly what reference sources are out there. With one exception, I couldn’t even recommend a comprehensive book on the subject as nearly every “How to Research” book I know of is either well out of date or so academic that you would probably struggle to get past the contents page. 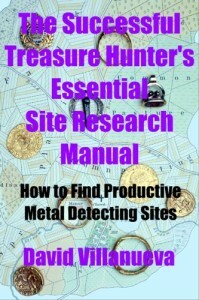 The exception is The Successful Treasure Hunter’s Essential Site Research Manual: How to Find Productive Metal Detecting Sites, which clearly explains easy research techniques to find sites for the recovery of coins and artifacts. If you are interested in improving your finds rate, you need this book, whether you are a beginner or an old-hand, even if you have no previous knowledge of research. It will tell you how to find essential records and how to carry out research in libraries, archives or on a computer — whether you own one or not. You will be able to read “case studies” and see the results, so you can decide the best form of research to find the type of coins and relics, which interest you. Maps are an important tool for site research so the main types of map since the 16th century are discussed in detail, including: county maps; Ordnance Survey; town plans; road maps; road, river, canal and railway construction maps; enclosure and tithe maps; estate maps; and sea charts. Studying aerial photographs used to be an expensive pastime but now, with the advent of hi-tech digital aerial and satellite photography, you can study the Planet from the air for nothing. This opens up exciting avenues of research where not only can you spot crop-marks but also such features as Roman and medieval farming, ancient routes, or even the positions of unknown Roman villas. Some archaeologists believe that 95% of archaeological sites have yet to be discovered! To “flesh out the bones” of your research you should look, even if only briefly, at written local histories. I am sure you will find them fascinating and just one book could suggest hundreds of potential sites, confirm your map and/or aerial photograph research, and help you secure that permission.